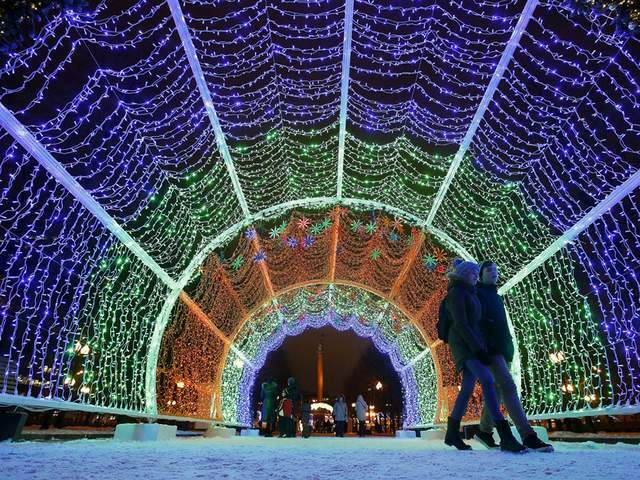 Christmas lights at a street in central Moscow, Russia, as an attractive festive part of the New Year and Christmas holidays. Unique decorations and impressive lights are spreading through the streets and illuminate the city in the evening, which creates exciting feelings. Winter holidays in Russia, which are happening on the night of December 31 against January 1, are the most colorful and the most beloved celebrations. While the rest of Europe celebrates Christmas as the main holiday of the winter, Russians give more attention to the New Year.